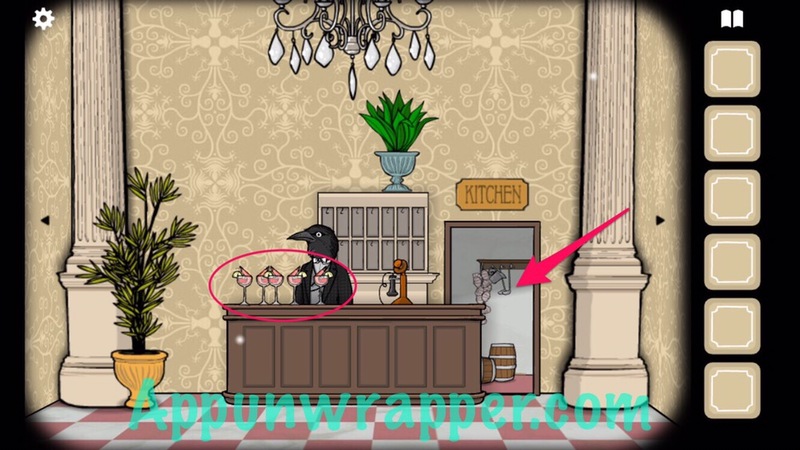 This is a complete step-by-step walkthrough for the iOS and Android game Rusty Lake Hotel. Feel free to ask for extra help in the comments section. 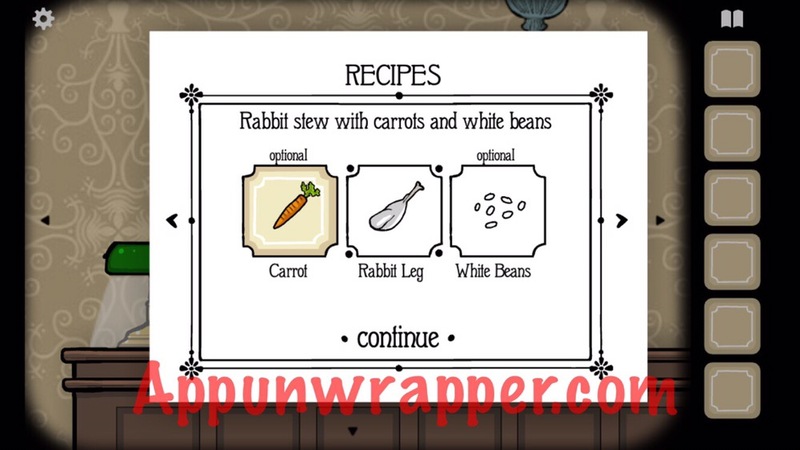 This walkthrough will show you how to get all the ingredients for each recipe and therefore all the stars in the game, as well as the secret specialty item. 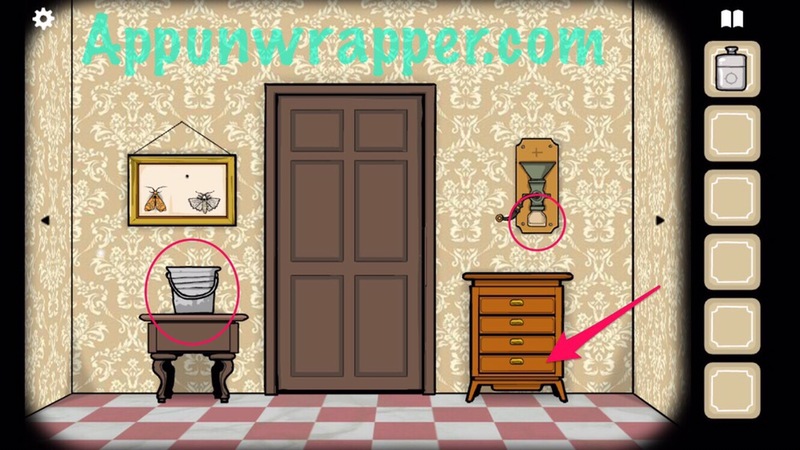 You must go through the rooms in a specific order and not miss any ingredients if you want to get all Perfect recipes. 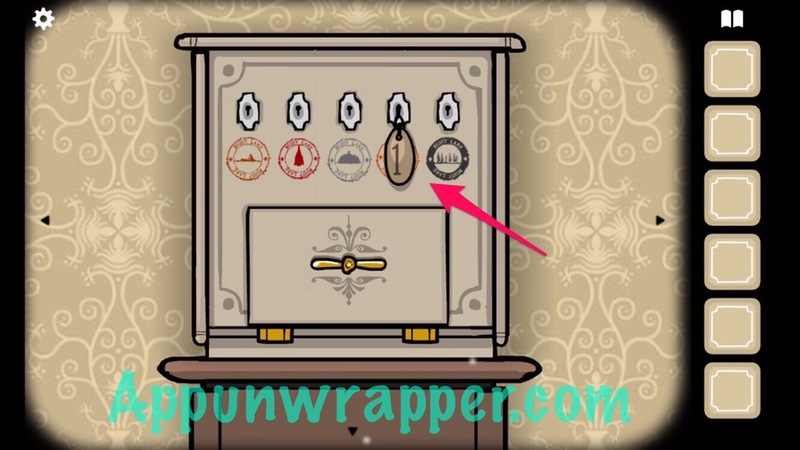 Each recipe starts with the first ingredient being found in the lobby. That tells you which room to go to next. 1. You start in the lobby. 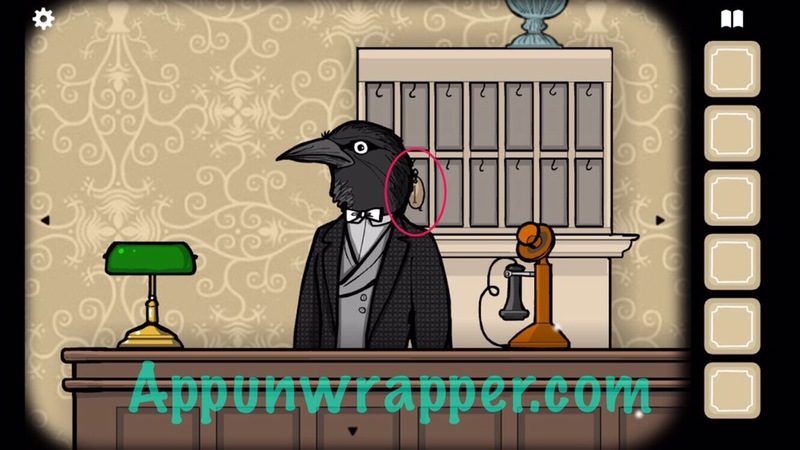 Talk to Mr. Crow. He tells you to serve the guests the local delicacy. Pick up all the shrimp cocktails. 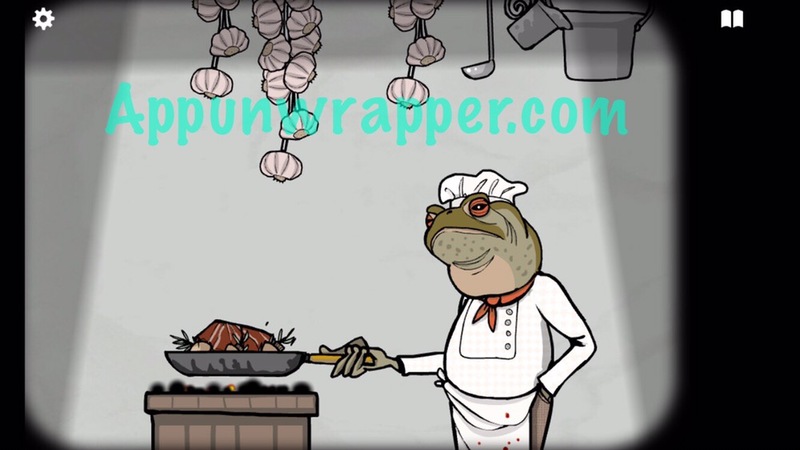 Enter the kitchen and talk to Mr. Toad. He’ll show you how to access all the recipes. 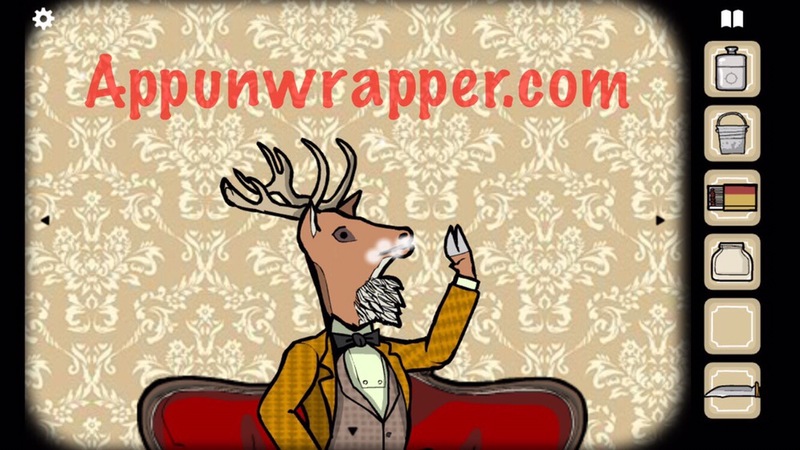 The first one you need to pay attention to is Mr. Deer’s. 2. 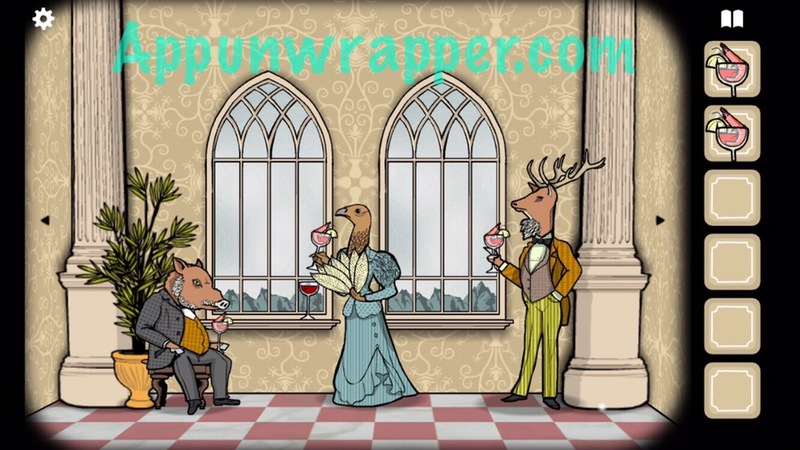 Go around the room and give shrimp cocktails to Mr. Rabbit, Ms. Pigeon, Mr. Boar, Ms. Pheasant, and Mr. Deer. 3. 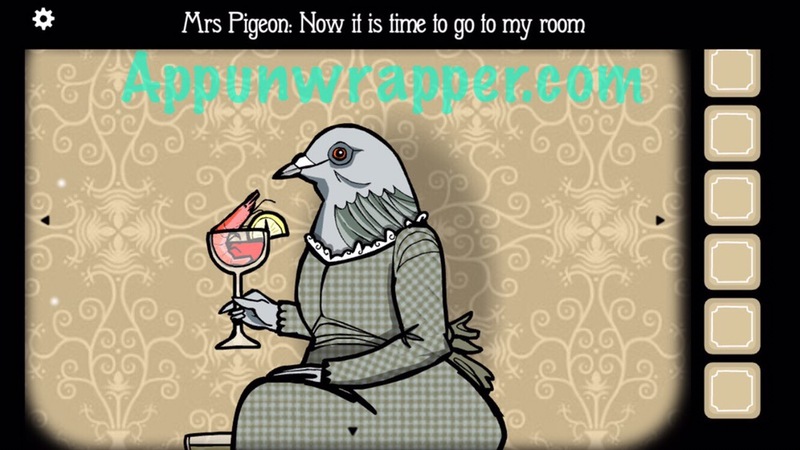 Tap on Ms. Pigeon’s cocktail and she should say that she’s going to her room. 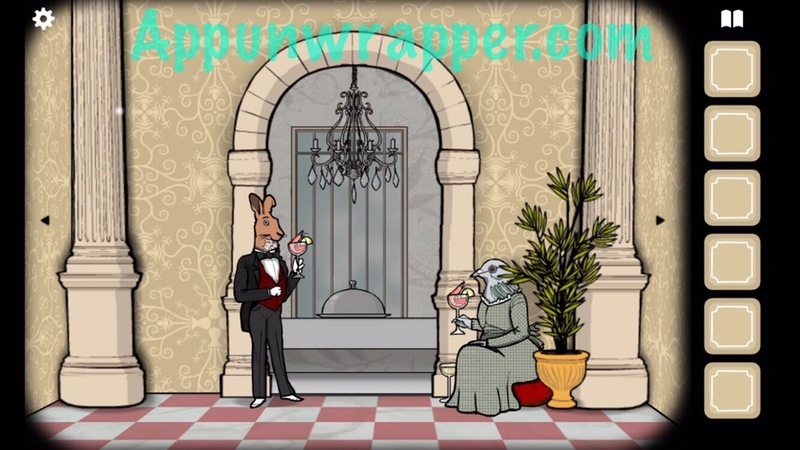 Tap again and all the guests go to their room. 4. Back in the lobby, answer the phone. 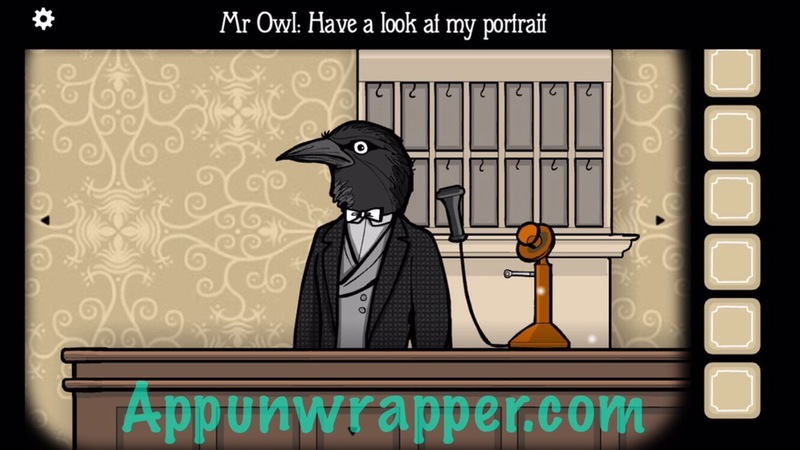 It’s Mr. Owl and he tells you to look at his portrait. 5. Turn around and find the portrait. Take the mushrooms from his hand. That’s the first ingredient for the deer steak with mushrooms and rosemary recipe. 6. 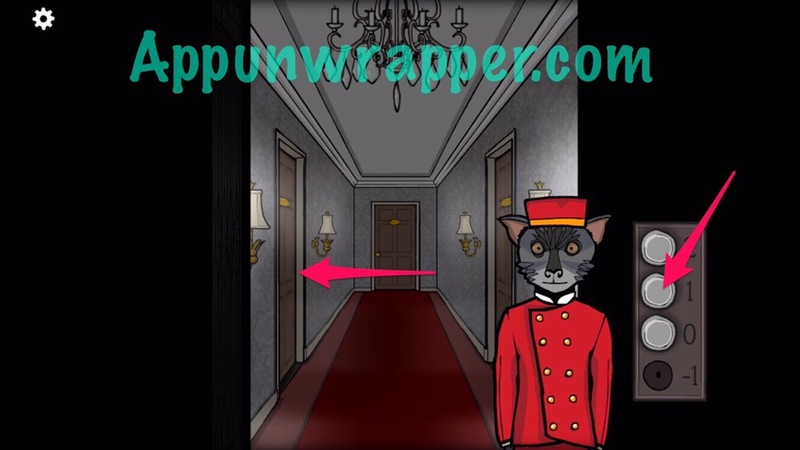 Get in the elevator and go up to the 1st floor. 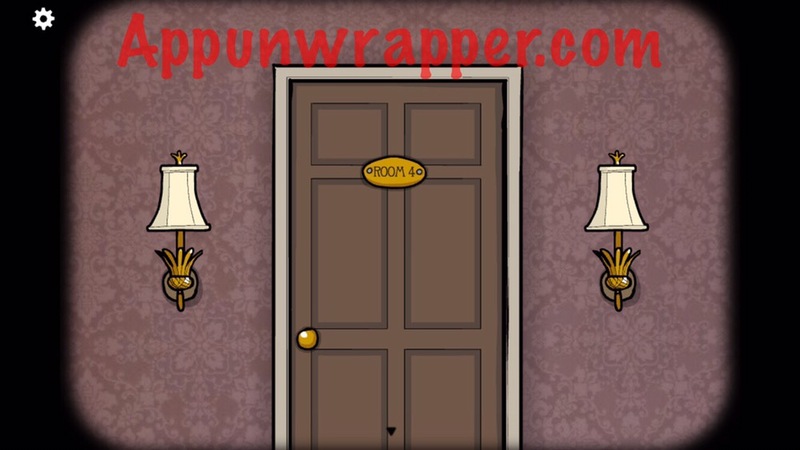 Enter Room 1 for Mr. Deer. 1. Mr. 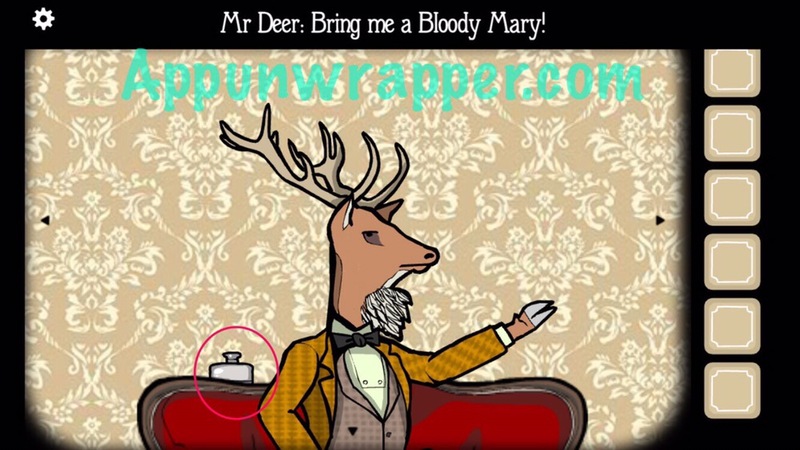 Deer wants you to make a Bloody Mary for him. Pick up the “wodka” and the key. Also, read the recipe for a Bloody Mary and “Mr. 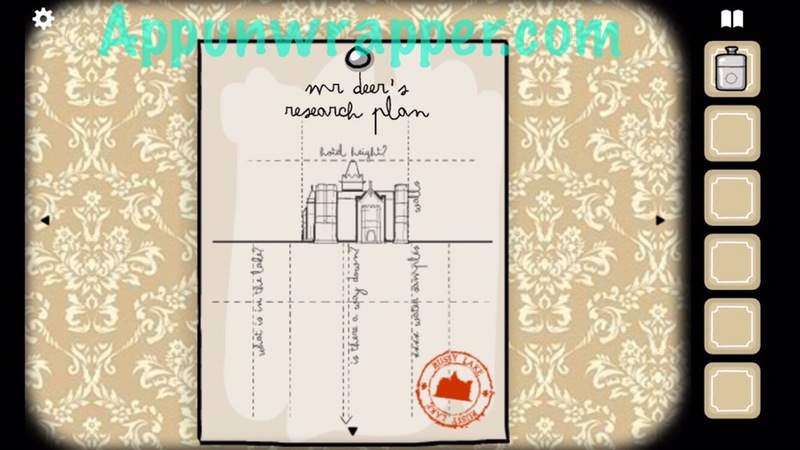 Deer’s Research Plan” on the wall. Memorize the stamp on the research plan. 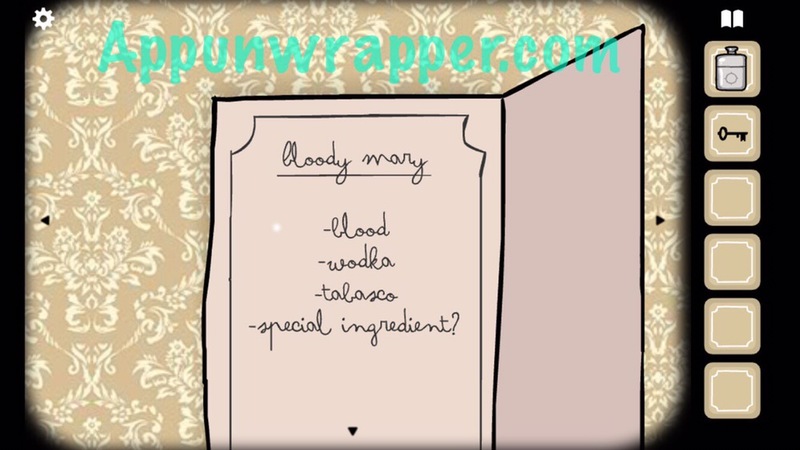 The Bloody Mary calls for blood, wodka, Tabasco, and a special ingredient. Add the wodka to the glass and you’ll have an empty canteen. 2. Tap on the deer skull on the wall to get an antler to grow. 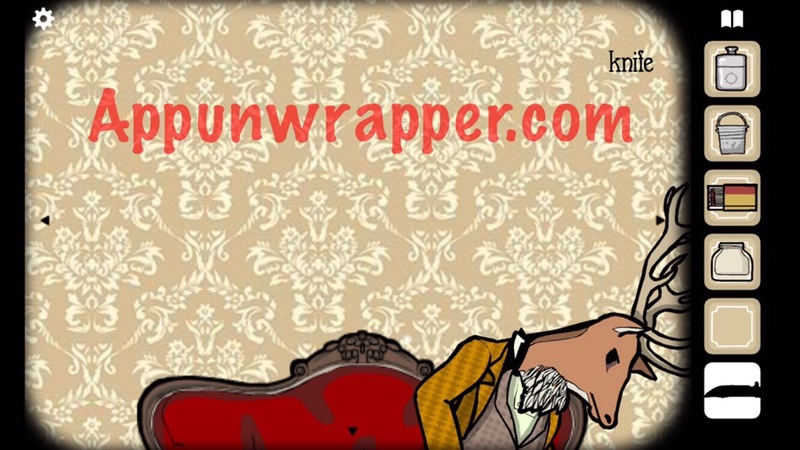 Keep tugging on parts of it until the both antlers grow and the nose bleeds. Fill the empty vodka bottle with some of the tabasco sauce. Also, make the rosemary grow and take it. That’s another recipe ingredient! 3. Add the Tabasco to the glass. 4. 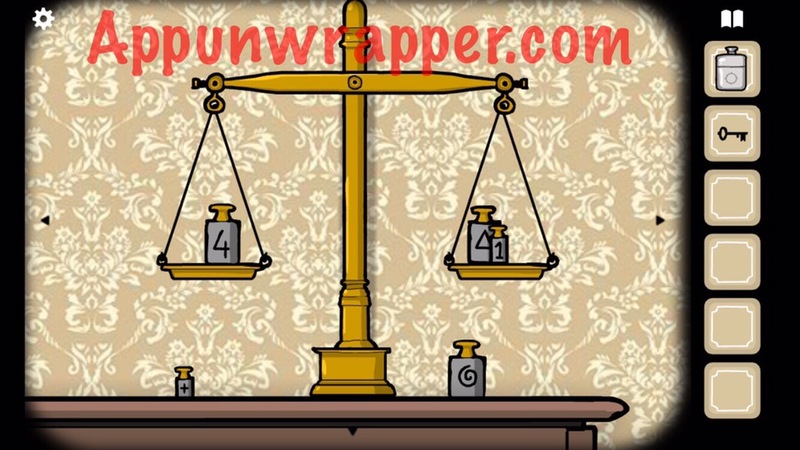 Turn right and use the scales to figure out how much each of the symbols weigh. You can see the “+” is 1, the triangle is 3 and the spiral is 5. 5. Use the key to unlock the cabinet full of beakers and flasks. We’ll come back to that soon. 6. Turn right and grab the empty bucket. 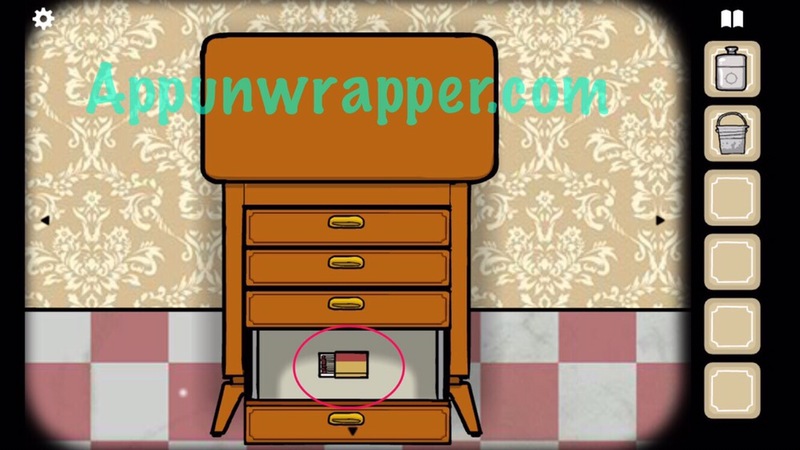 Also, open the drawer to get a box of matches. And last, take the glass jar from the grinder. 7. Turn right and open both windows. 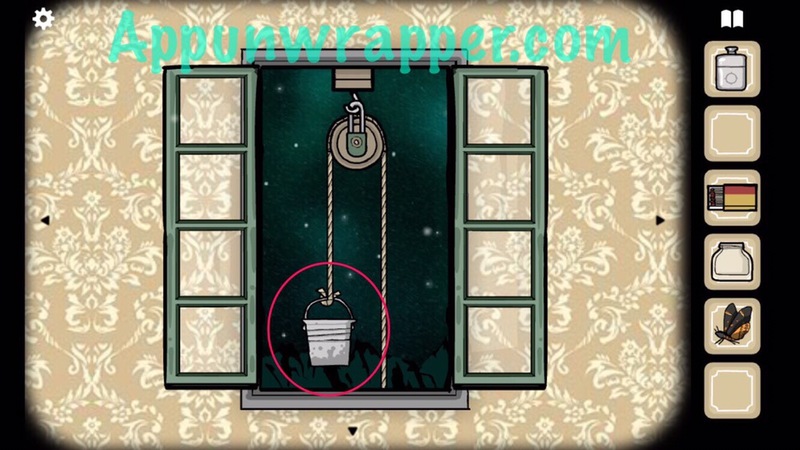 Place the bucket on the rope outside the left window and use the pulley to lower it and fill it with water. 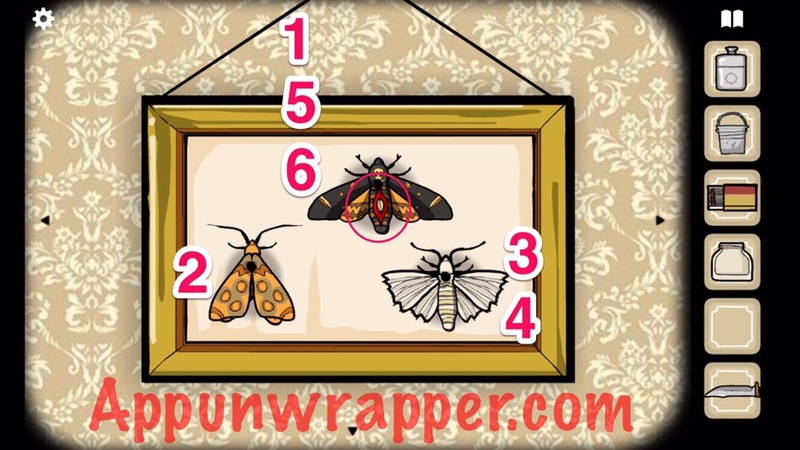 Use the glass jar to catch the butterfly outside the right window. 8. Now the locked box in the middle. 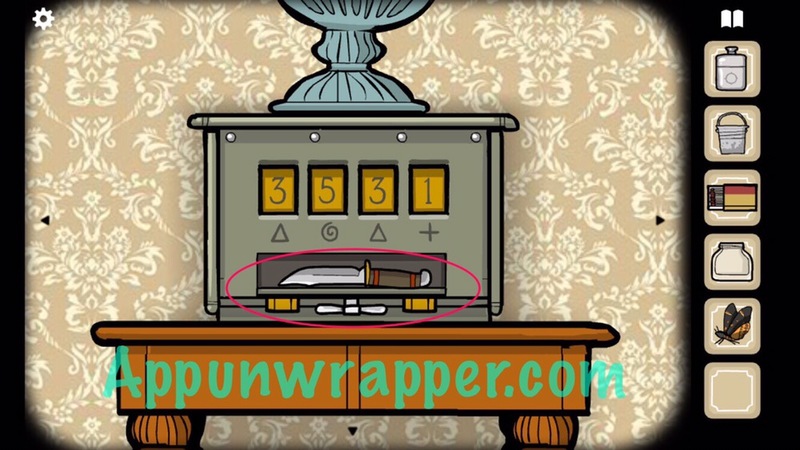 Use the numbers from the weights to unlock it and get the knife. It goes 3531. 9. 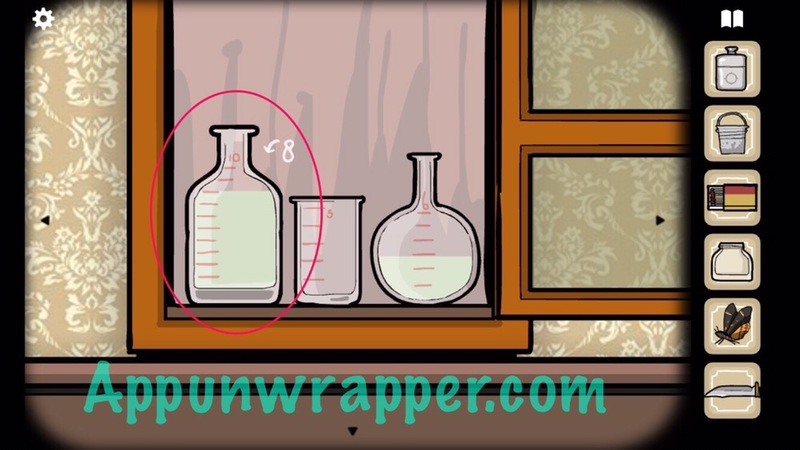 Go back to the beakers and flasks. Pour the water from the bucket into them and pour it back and forth until you get 8oz in the 10oz flask. To do so, first pour 5oz from the 6oz bottle into the 10oz bottle. Pour the remaining 1oz into the 5oz bottle. Pour 6oz from the 10oz bottle into the 6oz bottle. Pour 4oz from the 6oz bottle into the 5oz bottle. Pour the 5oz bottle into the 10oz bottle so there’s now 9oz in it. Pour the 2oz from the 6oz bottle into the 5oz bottle. Pour 6oz from the 10oz bottle into the 6oz bottle. Pour 3oz from the 6oz bottle into the 5oz bottle. 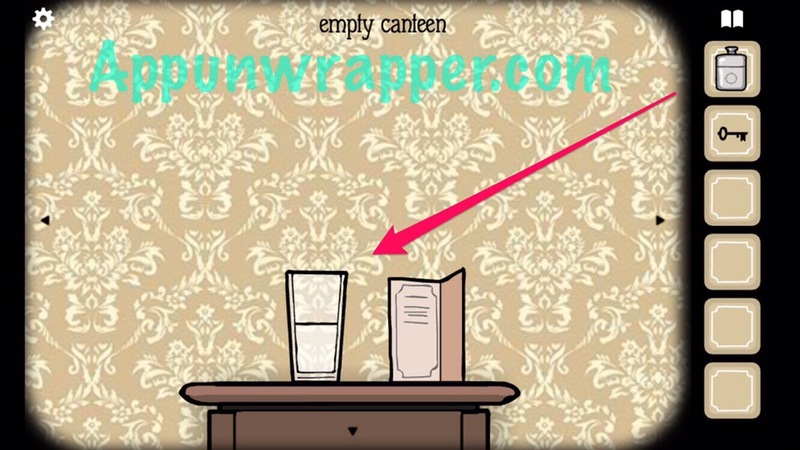 And last, add the 5oz from the 5oz bottle to the 10oz bottle to get 8oz. Take the bottle. 10. 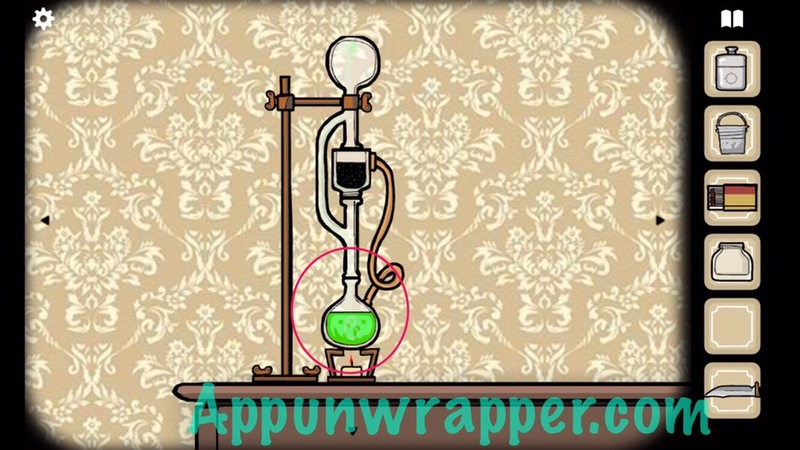 Light the candle under the Bunsen burner, then add the 8 oz of water. We’re still missing something. 11. 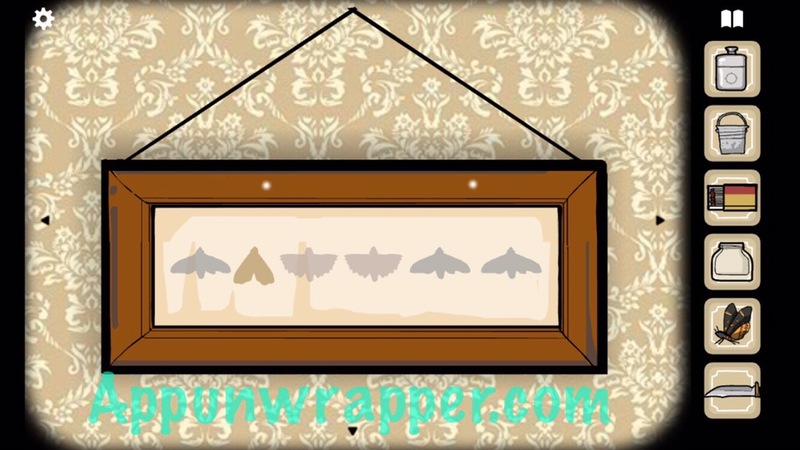 Look at the framed art of different butterflies. Take a screenshot or memorize it. 12. Add the butterfly next to the two moths. Tap them in the sequence you see in the painting. Take the seed from the top one. 13. 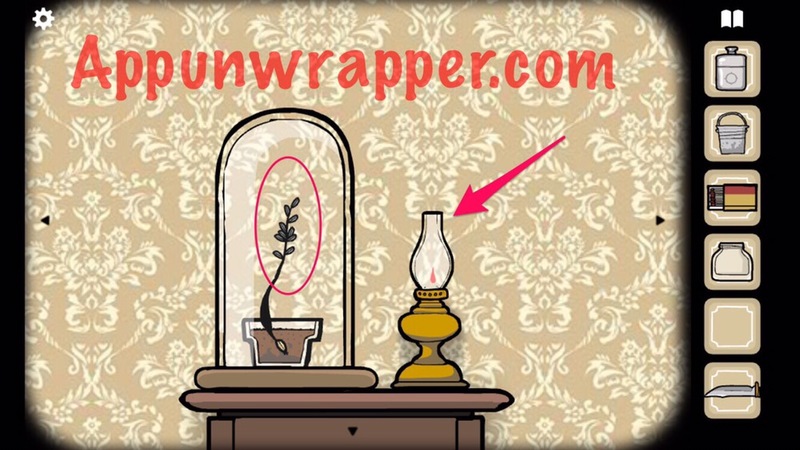 Use the matches to light the lamp. Pour some water from the bucket into the pot of dirt next to the lamp and add the seed. 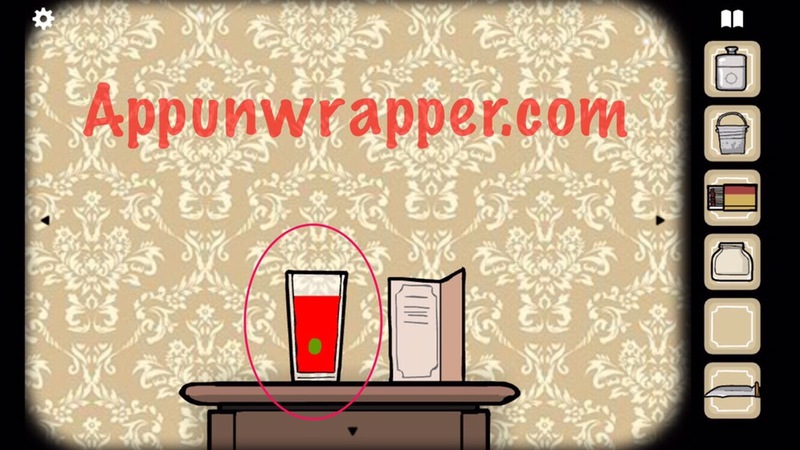 Close the glass, then tap the plant until it grows and turns into poisonous seeds. Take them. 14. Use the knife on Mr. Deer to make him bleed. Fill the empty canteen with his blood. Add the blood to the glass. Only one ingredient left! 15. 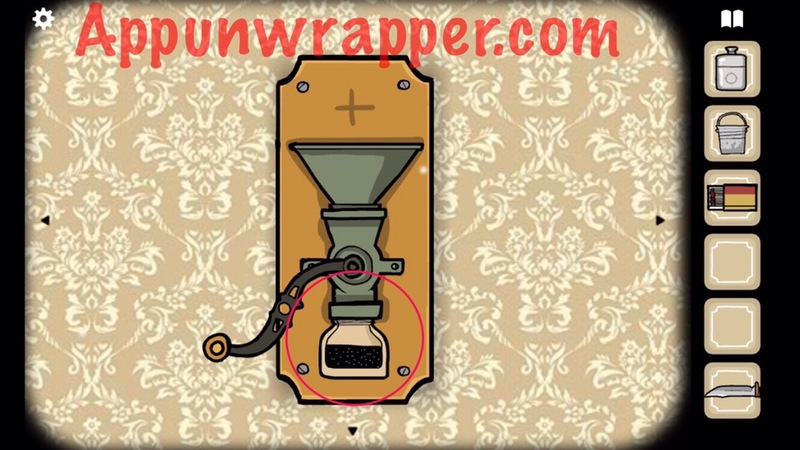 Place the glass jar back on the grinder and add the poisonous seeds. Grind them into a poisonous powder. 16. 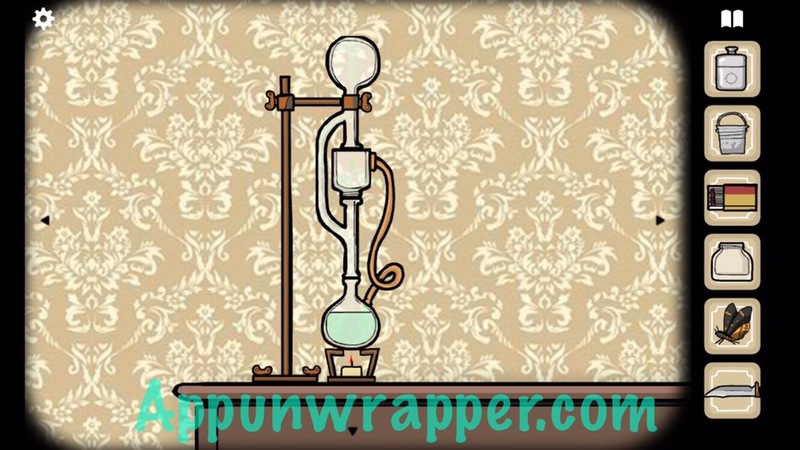 Place the poisonous powder on the Bunsen burner, then take the poison. Add the poison to the drink. Take the Bloody Mary. 17. Give the drink to Mr. 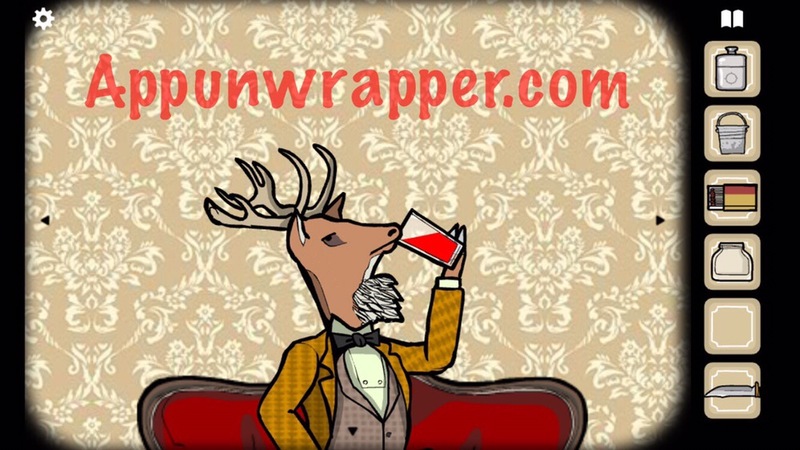 Deer and tap him to make him drink. Zoom out and he’ll start choking and die. Use the knife on him to get some of his meat for the recipe. This annoyed me a bit — why couldn’t we just kill him with the knife instead of poisoning him? 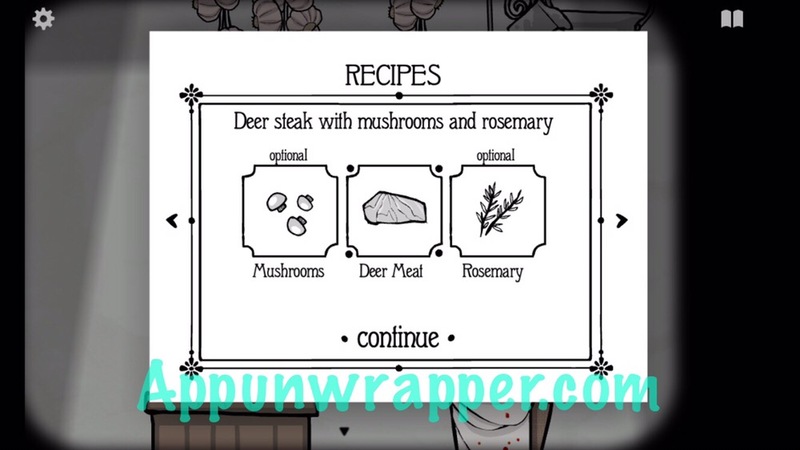 Anyway, you should now have all three ingredients you need for the deer steak recipe. 1. 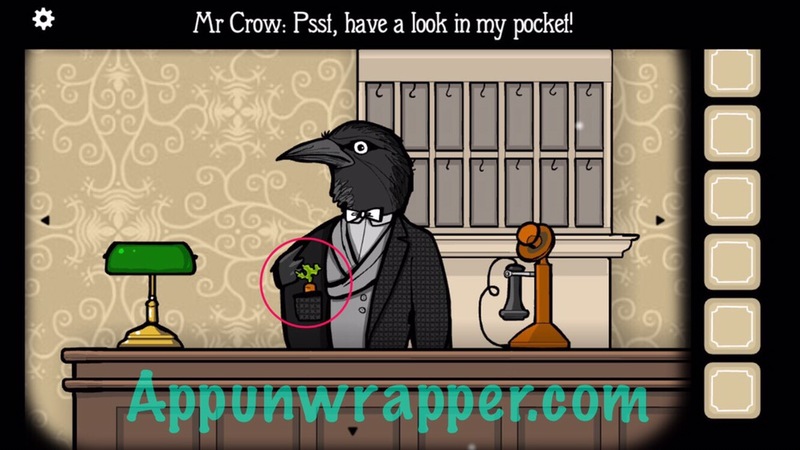 You can now pick up the key for the first room behind Mr. Crow. 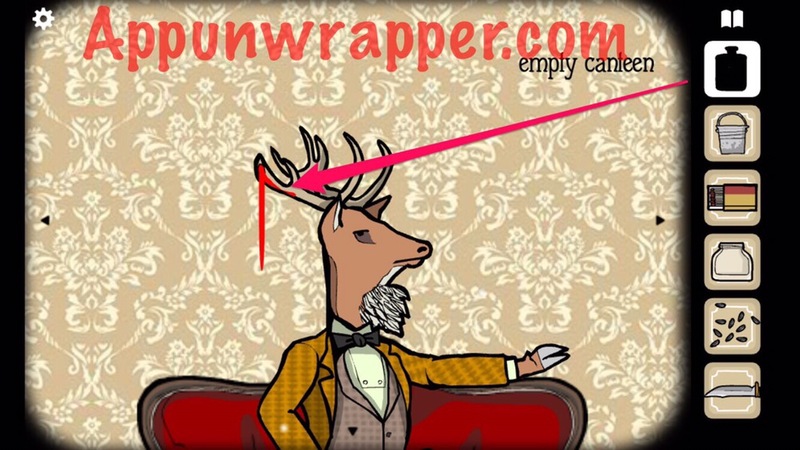 Then insert it in Mr. Deer’s keyhole in the locked safe. The same stamp was on the research plan in his room. 2. 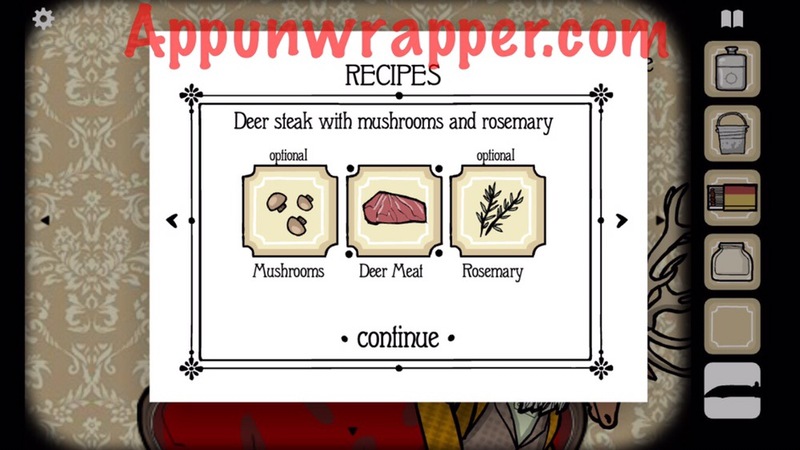 Go to the kitchen and give the ingredients to Mr. Toad so he can cook up the deer steak and serve it to the remaining guests. You should get 3 stars for it. 3. Talk to Mr. Crow. He tells you to check his pocket. Do so to find a carrot for the rabbit stew. 4. 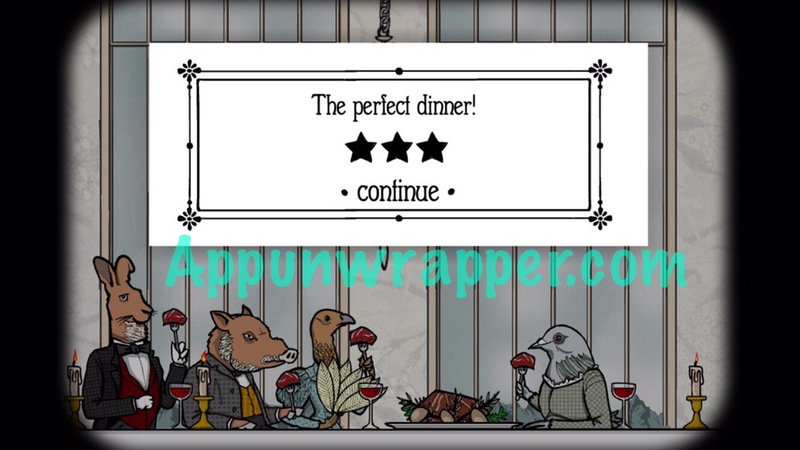 Head up the the second floor and go into Room 4 for Mr. Rabbit since we have the first ingredient for his recipe. Where is the Rosemary for the first recipe??? 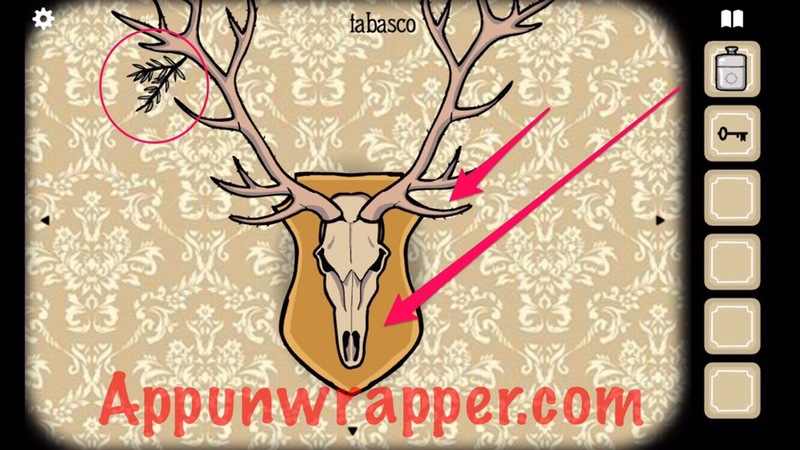 It’s hidden at the tip of the right deer antler. Meanwhile I can’t find the blueberries, potatoes, or white beans. The white beans are in the rabbits room, get the knife and cut the portrait of the owl. The blueberries are found in the pigeon room. Once you open the electrical box with the little “chick” in it. Turn it on and off 5 times and the blueberries show up in the chicks mouth. It’s a bat, not a werewolf. Rosemary can be found on the antler of the skull on the top right part you will see a little green leaf. Click it and rosemary will grow. Now I’m in need of some help finding the white beans for Mr. rabbit! The white beans are in the room with Mr Rabbit. 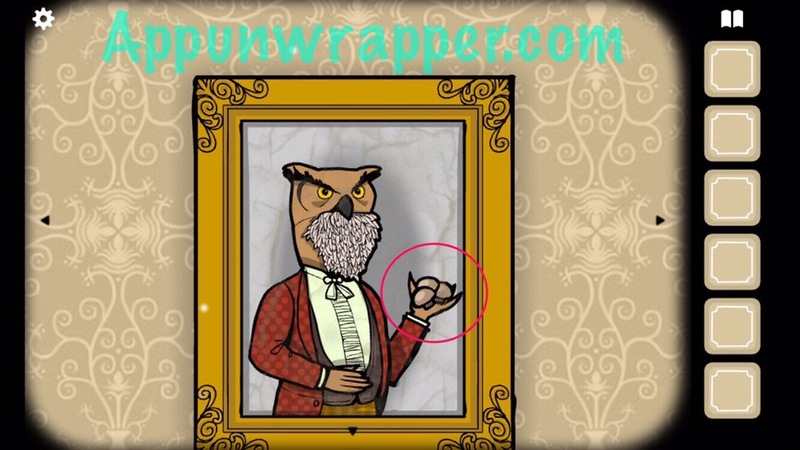 Use the knife on the forehead of the Mr Owl portrait. How do you get 8 oz? 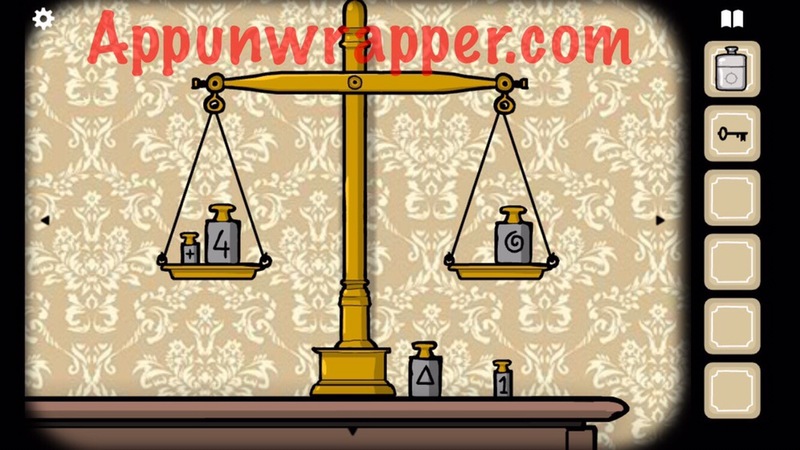 What do you do with the Secret Code? Hi there! 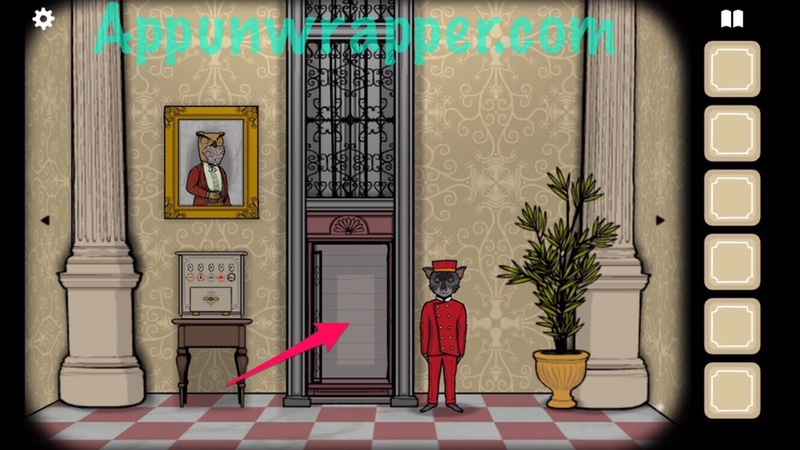 Where the other parts of the walkthrough is? Sorry, still working on it! Writing several walkthroughs at once. Please bear with me! Now you can get the bottle. It’s not trial and error like described. The monkeys tell you which to click on and in what order. One cymbal smash = first monkey (from left); two = second monkey; three = third. .Can you help me ,I can’t find the blackberrys ? Can anyone help with the beetle puzzle? I get so close…! It’s random each time. Even if I tell you the first move, there’s no guaranteeing where he’ll walk to next. 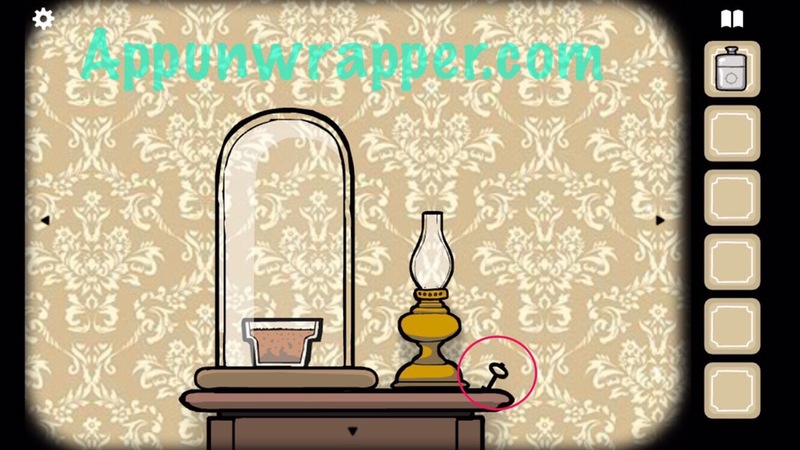 How to turn on the left lamp in pheaseant room? Dressing her up properly for the photos should do it. When I try to catch the butterfly in the glass in Mr. Deer’s room, it moves before I can get it. Is there something I’m doing wrong? Regarding the moth,-It’s a glitch on phones. 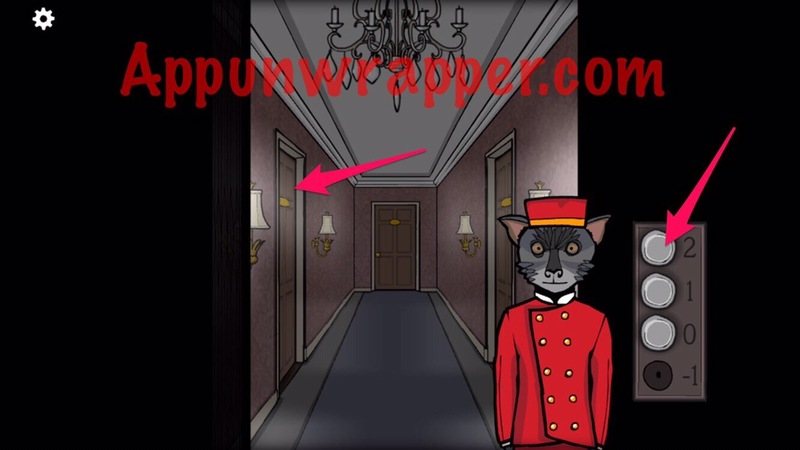 What you need to do is stand directly in front of the window (with moth) & exit to main menu, then back to game. The moth will be siting on ledge and easily caught. I’m really surprised it’s hasn’t been addressed, but then that is my ONLY complaint (except maybe more and more games, asap, please!!! ) 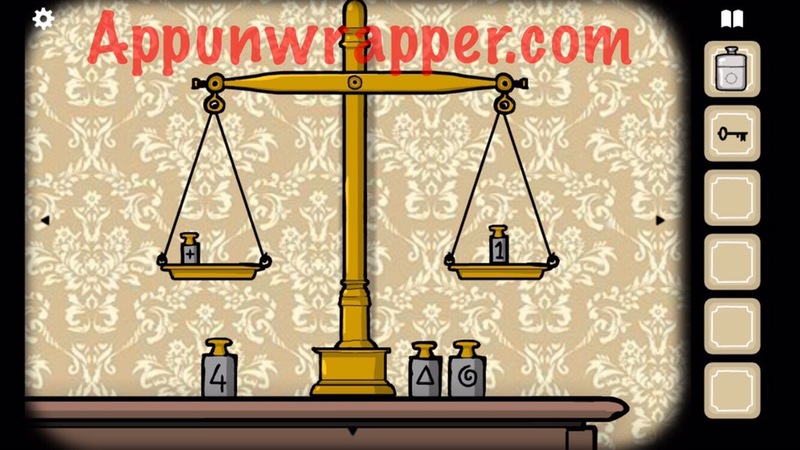 fantastic, eerie and complex but not impossible puzzling! Love them all! Anyone recommend some other similar games? Thanks! Hey guys, I’m stuck at the axe/lever thing in Boars room. I pulled it up and down once and now i cant pull it back up to cut…is it a glitch? I can’t catch the moth. It keeps flying off before I can get it. Please help! 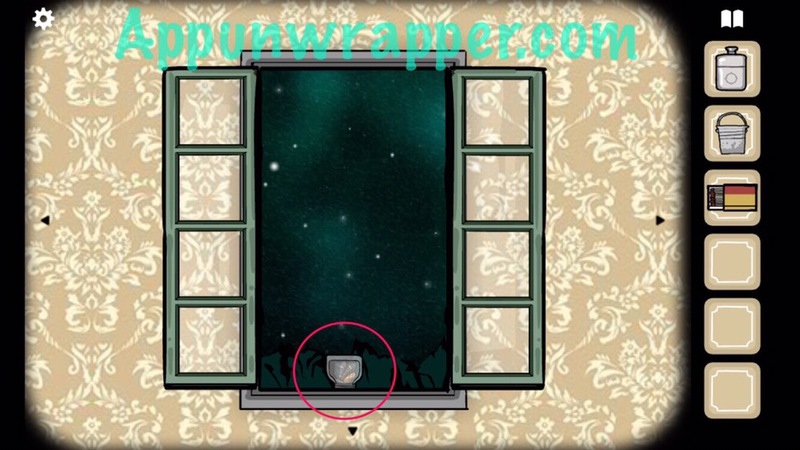 Click on the window, click back and then click on the window again – use the glass jar from the grinder and you’ll be able to catch him. I can’t take the crow picture in the Pheasant room. Even though I gave her the mask and drew the lines, confirmed by both lamps, the game insists something’s missing. Is this a glitch? I don’t know if it’s a glitch but I can’t find the knife anywhere. It wasn’t in the bottom drawer or anywhere? I can’t take the lady in blue pict. I draw the cross symbol on the frame and gave the hat and she says she’s not ready.